Cozen O’Connor attorneys Thomas McKay III, Richard Mackowsky, Charles Jesuit, and Melissa Brill recently secured summary judgment from the United States District Court for the Eastern District of New York in favor of Great Northern Insurance Company on claims asserted by Madelaine Chocolate Novelties seeking $49.5 million in coverage for Hurricane Sandy-related losses under an “all risk” property and business interruption policy. Madelaine manufactures seasonal foiled chocolates. It conducts its business in three buildings located in Rockaway Beach, New York, about three blocks north of the Atlantic Ocean and one block south of the Long Island Sound. On October 29, 2012, Hurricane Sandy caused substantial damage to Madelaine’s facilities mainly from the inundation of seawater that rose approximately four feet above the facilities’ slab. In addition to the property damage, Madelaine suffered a significant business income loss because it was forced to cease operations for an extended period of time extending through the 2012 holiday season. Madelaine Chocolate Novelties, Inc. v. Great Northern Insurance Company, 15 cv 5830, June 30, 2017 Report & Recommendation of U.S. Magistrate Judge Gary R. Brown, pp. 4-5. Madelaine’s facilities were covered by a Great Northern “all-risk” policy. Madelaine sought coverage for property damage in excess of $40 million and for business income loss in the amount of $13.5 million. Great Northern paid Madelaine $4 million for covered losses that were not subject to the policy’s flood exclusion, but denied coverage for the remaining $49.5M in alleged losses on the grounds that they fell within the scope of the policy’s flood exclusion. Id. at 4. Litigation ensued. Madelaine’s main claim was that a windstorm endorsement to the policy either granted coverage for the damages it sustained or created an ambiguity with respect to application of the flood exclusion to storm surge damage warranting coverage. Id. at 1. Great Northern’s primary defense in the litigation was that the damages at issue were excluded from coverage by the policy’s flood exclusion and that the policy’s windstorm endorsement served solely to apply an increased deductible for any losses occurring during a windstorm as defined by the policy. The parties’ agreed that the main issues in dispute revolved around policy interpretation and were ripe for disposition on cross-motions for summary judgment. The parties filed cross-motions for summary judgment which were initially submitted to United States Magistrate Judge Gary R. Brown for a report and recommendation. the loss or damage, even if such other cause or event would otherwise be covered. This Flood exclusion does not apply to ensuing loss or damage caused by or resulting from a specified peril. Id. at 6 (bolded as in original). The court found the term “storm surge” did not have to be specifically included in the exclusion because the exclusion’s terms were sufficiently broad to encompass it. The court further cited to an earlier case for the proposition that the term “storm surge” is simply a synonym for “tidal wave” or wind-driven flood. Id. at 17-19. As to Madelaine’s argument that the wind endorsement provided a separate basis for coverage, the court rejected it. The court noted that the last sentence of the windstorm endorsement stated “[a]ll other terms and conditions remain unchanged.” It further held, among other things, that the clear purpose of the endorsement was to increase the deductible applicable to windstorm coverage, which coverage was already being provided under the “all risks” policy, and not to create any new coverage or alter the policy’s unambiguous flood exclusion. Id. at 19-22. Madelaine objected to Magistrate Judge Brown’s recommendation, but on September 26, 2017 United States District Court Judge Raymond J. Dearie adopted Magistrate Judge Brown’s recommendation and granted summary judgment in Great Northern’s favor. Judge Dearie noted that the flood exclusion was unambiguous, numerous cases have determined that similar provisions exclude damage from hurricane-related storm surges, and the windstorm endorsement does not create or extend coverage, it merely increases the deductible applicable to wind claims. Madelaine Chocolate Novelties, Inc. v. Great Northern Insurance Company, 15 cv 5830, September 26, 2017 Memorandum & Order of United States District Judge Raymond J. Dearie, pp. 2-4. This is one of the largest remaining commercial insurance disputes arising out of Hurricane Sandy. 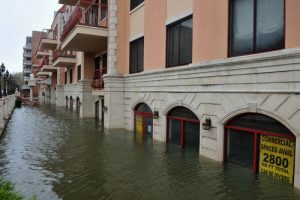 The court’s decision may provide support for insurers relying on flood exclusions and facing similar arguments from policyholders in the aftermath of recent hurricanes such as Harvey, Irma, and Maria.